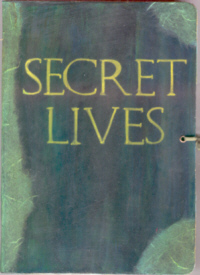 See inside Secret Lives, an altered board book made for the exhibit "Serious Fun" at the Bayview Book Arts Gallery in Milwaukee. 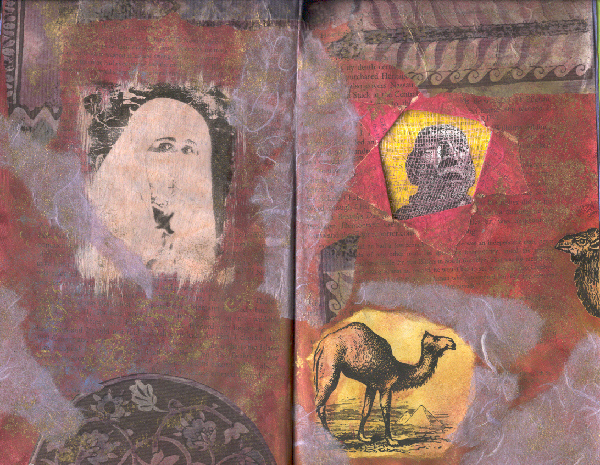 This altered book cover has a slider that shows "Before" and "After" images of men who want more facial hair. 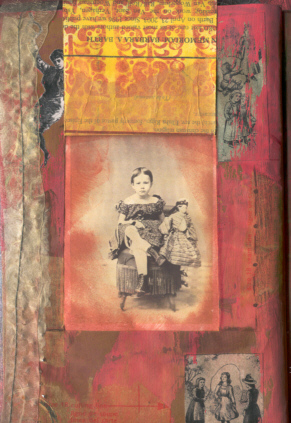 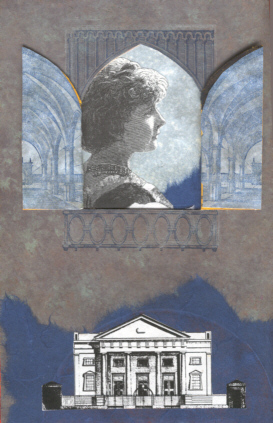 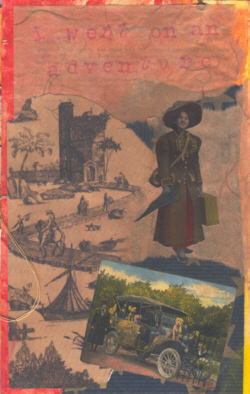 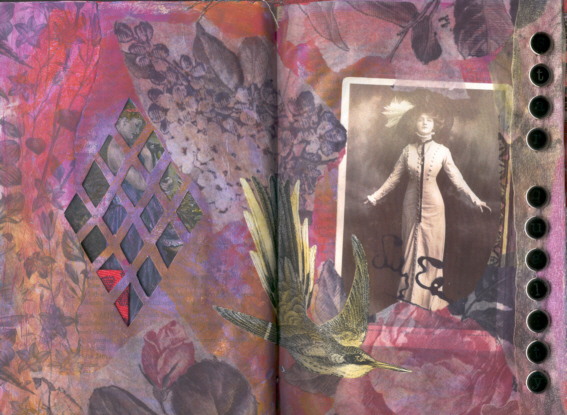 I like to include little interactive features that don't translate well to two-dimensional scanned images on a computer screen, but below are some spreads from this altered book sampler. My pages edges aren't actually that straight and neat. 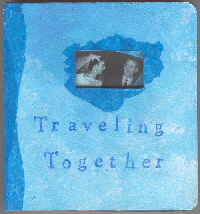 The book just didn't fit completely on my scanner so all the ragged edges were cropped. 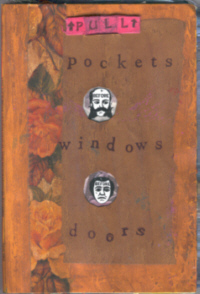 Corners of two pages are folded under and attached to backing pages with double-stick tape and eyelets to form pockets. 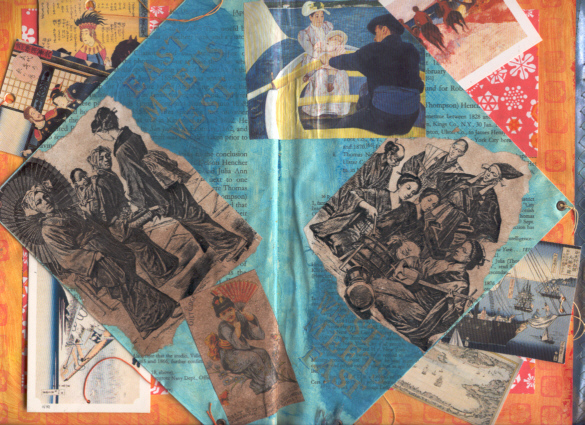 The images all relate to the cross-cultural influences of European and Japanese art, including European interpretations of Japanese culture and Japanese depictions of European visitors. 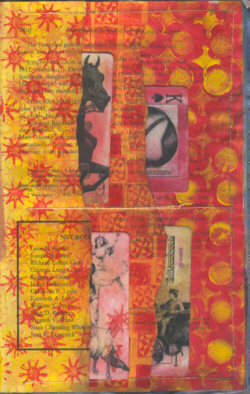 A series of pages were ripped vertically and sewn together to form cascading pockets, which hold altered playing card ATCs. 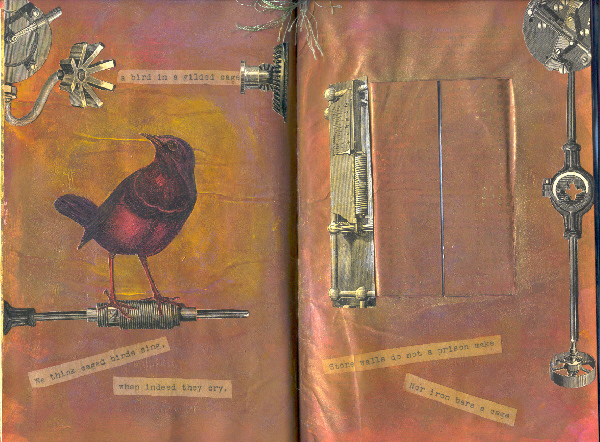 In this spread the pages were ripped horizontally and sewn to form pockets. 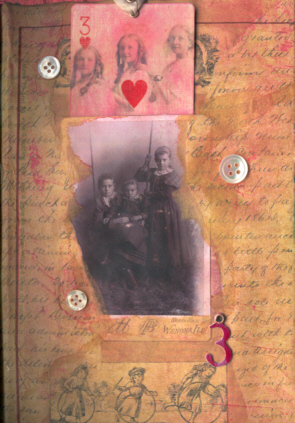 The bottom ATC has an image transferred onto wood veneer and attached to a playing card with eyelets. 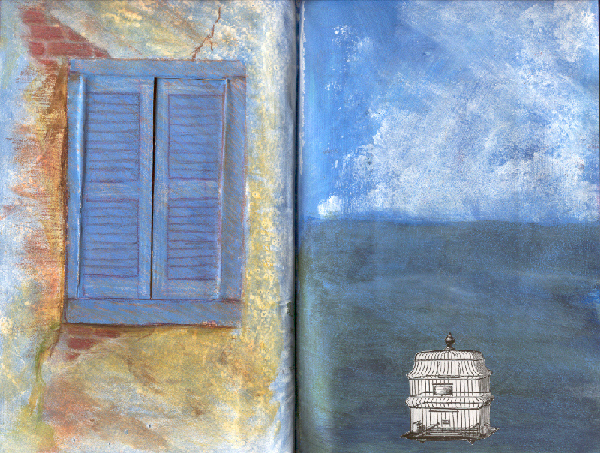 Two scans of the same spread show the window closed and opened. 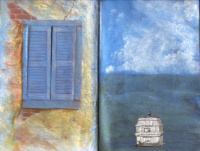 The next page shows the scene "outside" the window. 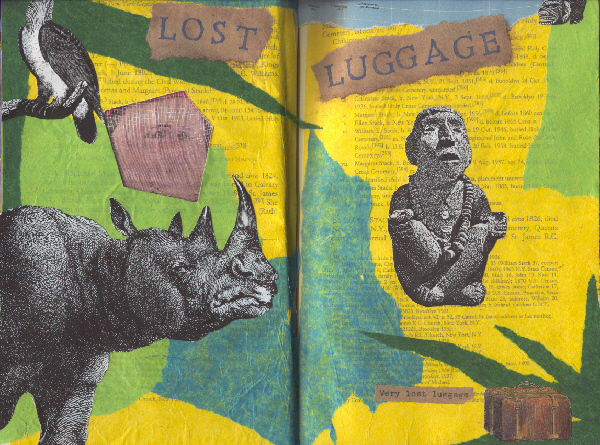 The page Mysterieuse (left) has a cheesecloth "window" looking onto the next page Lost Luggage (right). 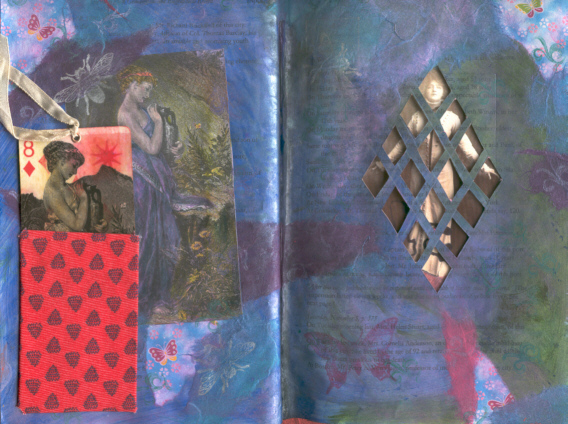 Two spreads are linked by a diamond lattice window. 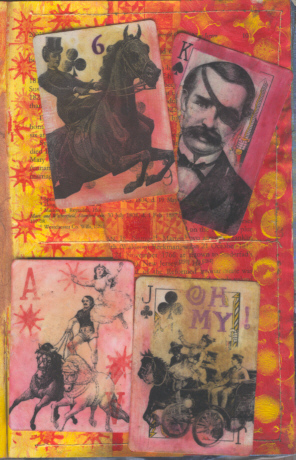 The red fabric pocket holds an altered playing card ATC that can be pulled out by a ribbon. 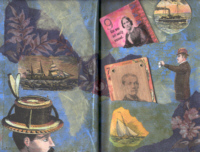 The typewriter key-style letters on the right spell "Star Quality". 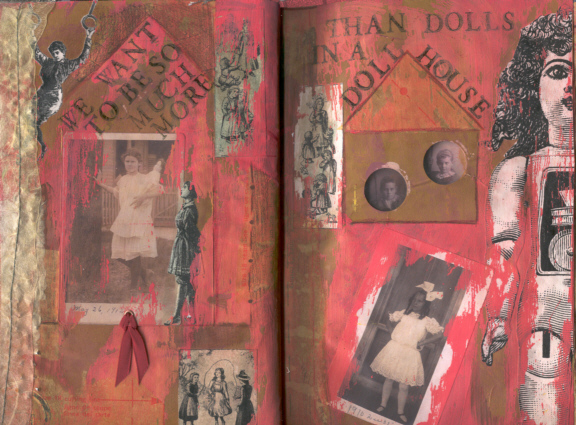 On the left page, the ribboned flap lifts to reveal a second image of a girl and her doll. 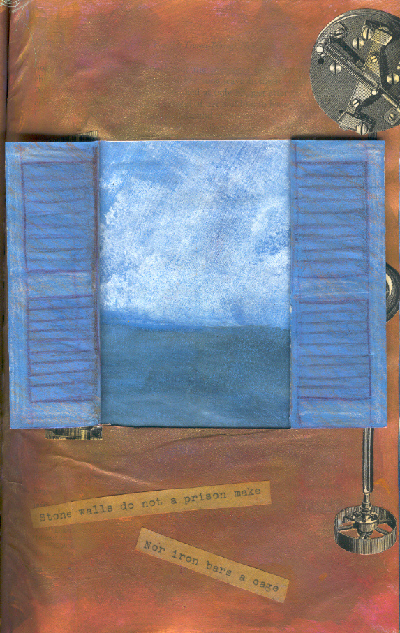 The two round windows have clear plastic "panes" in them, connecting this spread with the images on the previous pages. 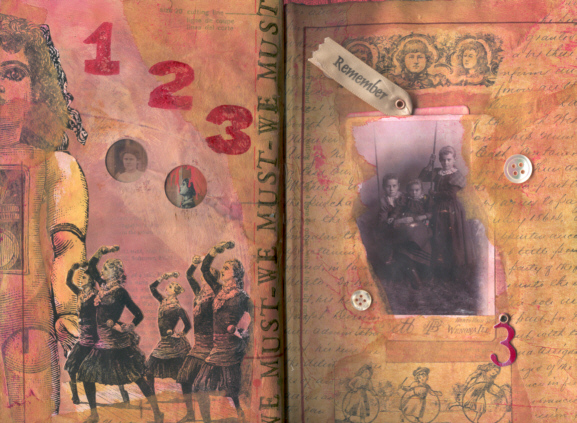 The ribbon on the right pulls up another image of three sisters. 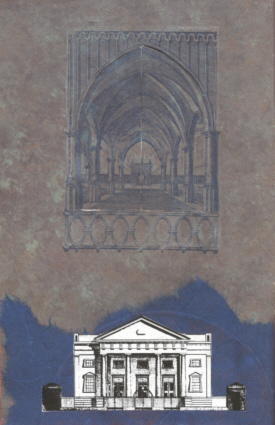 Back cover has a rubber-stamped architectural image that opens to reveal another image.